Many people are mortified when their child is sent home from school with head lice. One of the most common myths about head lice is that only people who are hygienically deprived have them. The truth is, head lice don't care if your hair is clean or dirty, if your house is spotless or grimy. All they want is to make a meal of your blood--clean or dirty hair doesn't matter at all. Before long, your hair is full of head lice eggs. You can't completely get rid of the lice unless you remove the eggs, too. The head lice eggs, nits, must be removed from your child's hair to stop re- infestation. There are products on the market, such as shampoos or conditioners that are designed to kill lice. Unfortunately, these do not also kill the larva in the head lice eggs. For this reason, most commercial lice products recommend retreating again within five to seven days. Any nits left in the hair will hatch and re-infest your child's hair. Once you have killed the lice, and rinsed them away, you need a comb with tiny, very close teeth to comb your child's hair. This will remove most of the nits, but is not likely to get them all. You can find these combs at your local pharmacy. A third application of the shampoo or conditioner applied five to seven days after the second application should take care of any lingering hatchlings from missed nits. 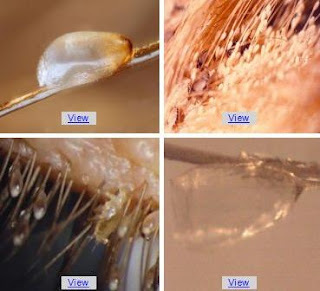 Nits are attached to the hair shaft with a type of glue secreted by the adult head lice. They are so small, they are very difficult to see, especially with light or blonde colored hair. Some people will sit with their child out in the sunlight which will make it easier to see the tiny nits, section hair into small amounts, and hair by hair look for the nits. Nits can then be pulled loose and down the hair shaft and off the end using fingernails, or alternatively, if there are not many left, you can pull the individual hair out of the child's head. This works better for children with short to shoulder length hair. Longer hair is more difficult, but with patience and time, the parent can remove all the nits. Some people prefer to shave or buzz a child's head. While this may or may not be appropriate for boys, it should be avoided with girls. However, if a girl's hair is extremely long, and gets re-infested on a regular basis, it would be easier on both child and parent if her hair was cut at least to shoulder length. One woman stated, "It is not shameful to have head lice. It is shameful not to get rid of them." While human head lice do not carry diseases, they are still an annoyance, and cause painful itching. Using the methods above, parents can remove head lice eggs from their children's hair. Parents should also have their own hair checked for lice and nits, since lice move from one person to another through head to head contact. 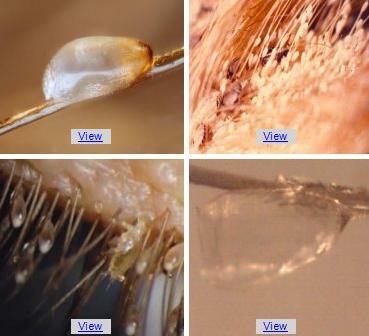 But keep in mind that removing lice eggs can be very time consuming and is generally considered a real pain. There are some newer, advanced strategies for dealing with head lice without much that much effort and without the need to pick nits!